A few years ago, Mr. Gagstetter gathered the track team after our daily warm up and told us that he would be leaving BHSEC within the month. He could barely finish his announcement before we realized it was fortunately an April Fool’s joke. But now, three years later, Mr. Gagstetter is officially leaving BHSEC. When Mr. G started working at BHSEC in 2008, he had recently graduated from SUNY Cortland and made up half of our P.E. department. He’s since taught health and gym and has consistently coached our school’s outdoor track and cross country teams. In the nine years he has been here, Mr. G’s presence has truly shaped BHSEC: Who could forget his infamous karaoke performances? Or the annual pi run? He even founded the school’s cross country team. His own life has changed in recent years too; he got married in 2013 and became the father to his first son, Bryce. At his new position, Mr. Gagstetter will be helping New York City health teachers implement new curricula. “I’ll definitely miss working with teenagers and with my student-athletes especially. I’ll also miss coaching and BHSEC overall,” said Mr. G.
We will miss his daily presence at our school, but Mr. Gagstetter will probably visit BHSEC to help with our own health program, so keep your eyes peeled! 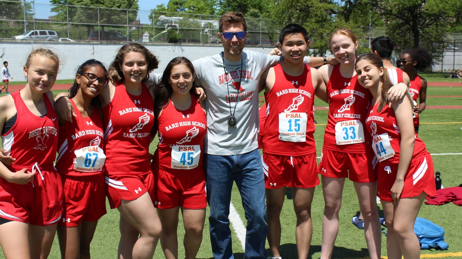 Mr. G and the seniors of the 2017 outdoor track team. photo creds to Ms. Schultz.